Looking back through my last few posts it is evident that I have been doing more colour work recently. This has not been intentional and I am enjoying the variety, but monochrome is still my first love. 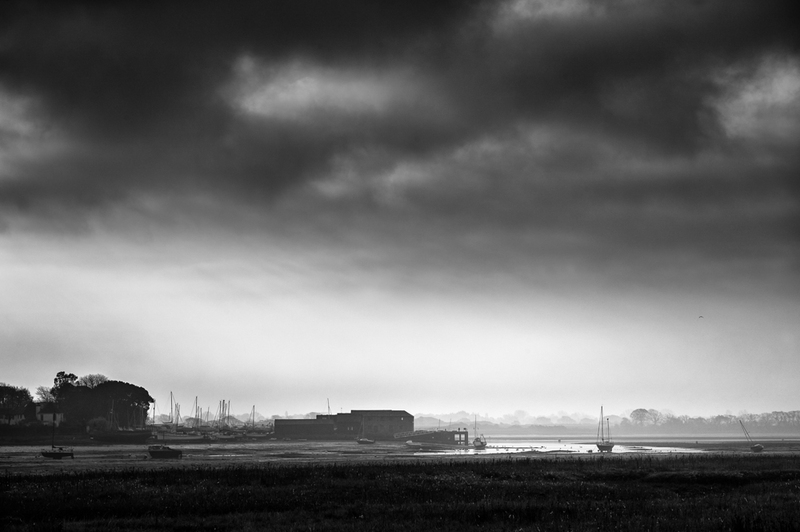 This image of Dell Quay, taken early one morning a few days ago, when the tide was very low, reminds me of why black and white photography is favoured not just by me but so many photographers. The artistic interpretation of a scene holds greater possibilities in mono than it would in colour. I enjoy the whole process of increasing or reducing contrast in certain areas of the image; thereby creating mood and atmosphere in the picture, whilst providing a sense of depth and a focal point of interest. Like so many images this one really needs to be viewed large as there is in fact a lot of detail in the scene. The masts in the boat yard, the three sailing boats to the right and a lone person standing on the jetty. There are also a few swans in the water and a gull flying into the frame from the right hand side. I have yet to print this photograph but I am looking forward to doing so. Do click on the image to enjoy a larger version. Dell Quay forms part of Chichester Harbour in West Sussex. Designated an Area of Outstanding Natural Beauty, it is popular with sailors, birdwatchers, walkers and artists; in fact anyone seeking some relaxation in some truly beautiful and unspoilt surroundings. My fault Andy, there was no link behind the photograph, so I’ve now changed it to ‘media file’ which should enlarge the image. I am often at Dell Quay or around Chi Harbour as it’s our dog walking area, so there is every chance we might bump into each other one day. I will look out for the man with the Leica! You’re more likely to spot our cocker spaniel first!